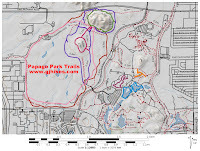 The 5k Fitness Loop is located at Papago Park in Phoenix, Arizona. 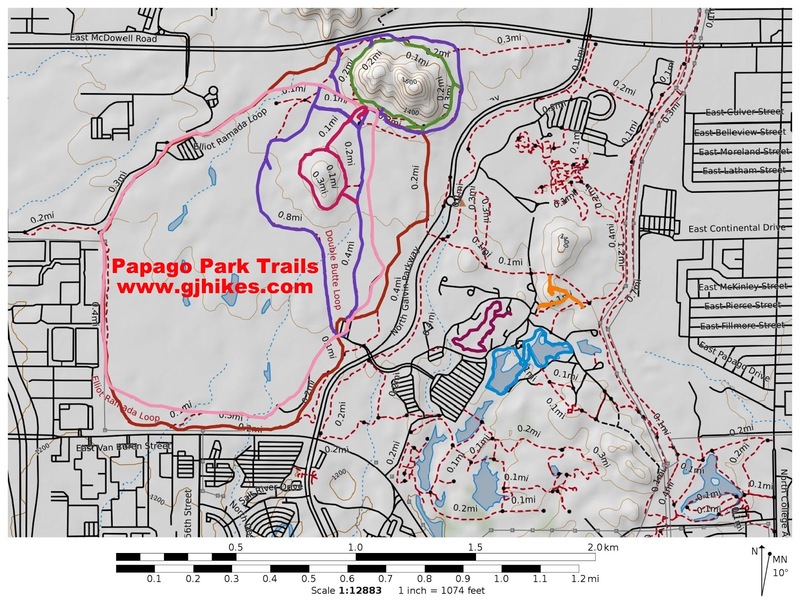 Beginning at the West Buttes trailhead the 5k Fitness Loop follows a route that takes it between Little Butte and Big Butte and then around the Papago Golf Course before returning to the trailhead. The trail is composed of hard packed crushed granite mixed with a few short stretches of pavement and concrete. The trail is wheelchair accessible with some assist due to grades. To get to the West Buttes trailhead find your way to 626 North Galvin Parkway, across from the Phoenix Zoo, and follow West Park Drive to the parking area. At present there is drinking water available at the trailhead but no restroom facilities. The trail begins across the paved road just northeast of the ramada. The wide crushed granite path is well laid out and easy to follow. The grade of the trail increases in places like this where washes and other seams are encountered. Heading from south to north the general trend of the trail is uphill. As the trail passes between the Elliot Ramada and Big Butte it is routed along the shoulder of the pavement. After passing the Elliot Ramada the trail follows a dog leg that takes it almost all the way up to East McDowell Road. This scenic section of trail is just enough extra distance to stretch it out to a full 5k. The trail reaches its highest elevation at the top of the dog leg where it turns back toward the south. 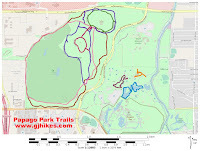 The 5k Fitness trail meets back up with the paved road where it shares routes with the Elliot Ramada Loop for a short distance. Various stations that offer other forms of fitness besides walking and running can be found as the trail heads past the golf course. A wooded area along the southwest stretch of the loop adds some contrasting scenery to the trail. 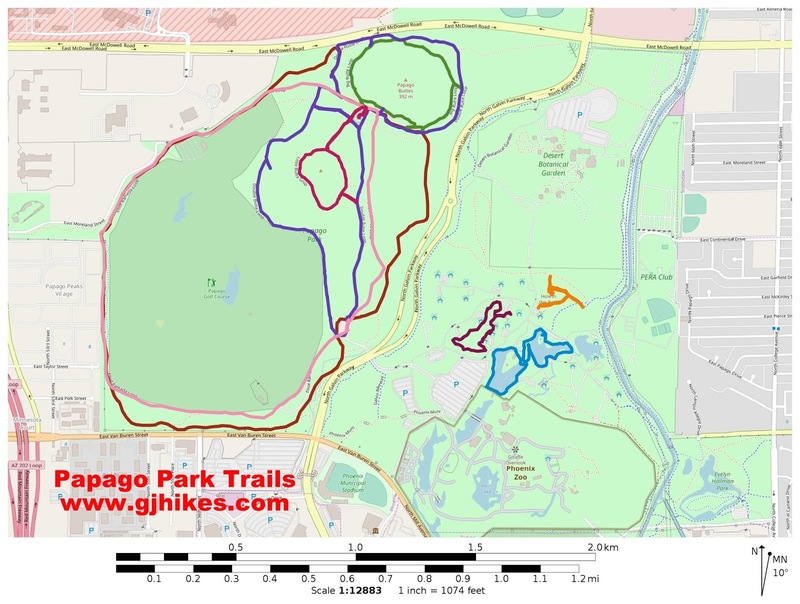 The trail continues looping around below the golf course until it finishes up back at the parking area. Even though we followed the loop in the counterclockwise direction for this post there was no reason that we couldn't have gone around it clockwise. We took the photos for this post around the 4th of July weekend when the temperatures were reaching well over 100F. The trails are closed to dogs when the temperatures reach 100F and above but on this day they were still getting plenty of use from hikers, mountain bikers and trail runners. If you would like to see it for yourself then all you have to do is 'Take a hike'.